Ajona is a medical toothpaste concentrate for the daily oral care of teeth, gums and tongue. The special formula makes Ajona with many natural ingredients antibacterial. The concentrate is five times more productive than conventional toothpaste. Please use Ajona at least twice a day and brush your teeth for about 3 minutes, so that the high-quality, nourishing ingredients can unfold their full effect. 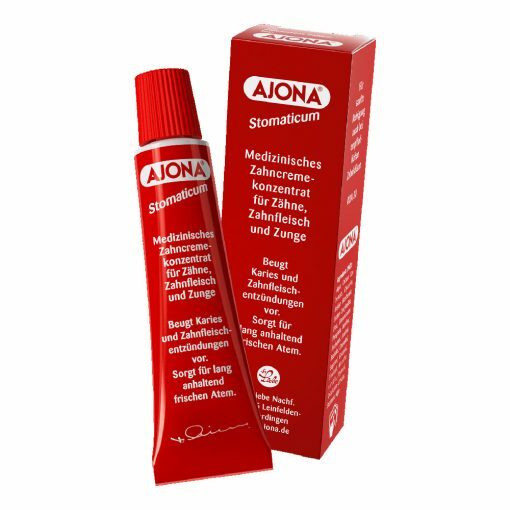 Ajona is a medical ZAHNCREMEKONZENTRAT and about five times as much as normal toothpaste. Please use sparingly! A large quantity of lins is sufficient – ideally suited for use with electric toothbrushes. After the enjoyment of sour food and beverages (fruits, salads, orange juice, etc. ), you should wait around 30 minutes to brush your teeth to allow the enamel surface to remineralize. Because you only need a very small amount you can use the tube for a very long time. You might have to get used to the taste. I am very satisfied with the cleaning. Teeth feel very smooth afterwards and although it is not full of peppermint taste like other toothpastes, it gives a pleasant taste in the mouth. In my childhood I already used this toothpaste (37), then it fell into oblivion, now I consciously use it again for some years because it contains no fluoride. I find the taste pleasant, the cleaning effect super. I don’t have a single broken tooth, even without fluoride!